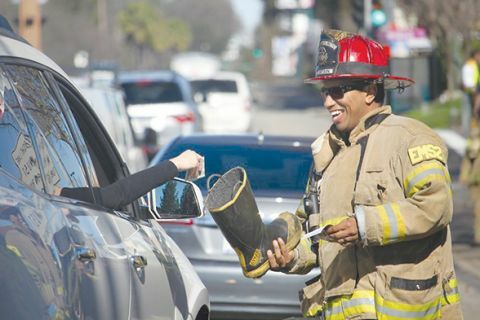 CITRUS HEIGHTS, CA (MPG) - Firefighters from throughout the Sacramento area are suited up and ready for this year’s 24th annual “Fill the Boot for Burns” Boot Drive to be held in Citrus Heights February 8th through 11th. Firefighters from many of the fire departments serving Sacramento and the surrounding communities will spend their day shaking their boots and volunteering their time to collect donations at the intersections of Sunrise Blvd. and Greenback Lane in Citrus Heights. Firefighters will be collecting donations to support the Firefighters Burn Institute (FFBI) and assure that the best possible burn treatment and recovery programs are available in Northern and Central California. The Boot Drive is open to the public and will include a FREE Safety Fair on Saturday, February 10th, from 11:00 a.m. to 2:00 p.m. The Safety Fair will include fire department displays, helicopter landings, vehicle extrication demonstrations and fun activities for the kids. This event will be held in the Sunrise Mall parking lot, weather permitting. Donations collected during the annual boot drives have also made it possible for the FFBI to pledge two million dollars toward the construction of the new FFBI Regional Burn Center at UC Davis Medical Center. The 7,900-square foot, 12-bed burn unit now provides comprehensive care with the most technologically advanced treatment options available to burn patients throughout inland northern California, northwest Nevada and southern Oregon. The FFBI, founded in 1973 by Sacramento Area Fire Fighters, Local 522, has grown into the area’s largest firefighter-run charity. It helped establish the first burn unit in Sacramento in 1974 and continues to donate medical equipment, fund burn research and provide free burn recovery programs, including two annual camps for young burn survivors. The Firefighters Kids Camp is held each summer for kids ages 7 to 17 years, and the Little Heroes Preschool Burn Camp for children ages 3 to 6. These camps provide burn survivor children a safe place to be just like everyone else and provide a positive environment to overcome challenges and achieve goals. Camp provides an opportunity for kids who have experienced terrible circumstances to see a future filled with endless possibilities. Please come out and show your support and help our Firefighters “Fill the Boot for Burns!” For additional information please contact the Firefighters Burn Institute at (916) 739-8525 or visit their website at www.ffburn.org.